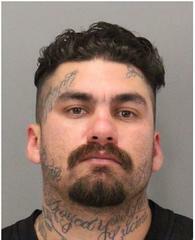 On Sunday, March 10, 2019, at approximately 11:44 A.M., the Milpitas Police Department responded to a report of a domestic disturbance inside a vehicle near the Great Mall of the Bay Area at 1100 Great Mall Drive. The reporting party saw Flores, and female passenger arguing inside a vehicle. Flores began hitting the victim several times while driving along Montague Expressway. Flores started driving erratically which caused a collision with another vehicle. Milpitas Police Officers arrived on scene within seventeen (17) seconds of the collision; and two (2) minutes of the initial call for service. Flores attempted to flee the scene, but was taken into custody after a brief foot pursuit. During the investigation, officers determined the victim had a restraining order protecting her from Flores. Several minutes prior to the reported assault in Milpitas, Flores forced the victim and her three children into the victim’s vehicle outside her residence in San Jose. Flores then drove the victim and her three children through Milpitas before being taken into custody. The victim and her children were safely reunited with family members. Flores was booked into the Santa Clara County main jail for domestic violence, a restraining order violation, kidnapping, false imprisonment, auto theft, child endangerment, fleeing the scene of a traffic collision, narcotic-related offenses, and an outstanding warrant. The Milpitas Police Department would also like to thank the public for immediately contacting 9-1-1 to report this in-progress crime. Your quick action led to the immediate arrest of Flores and the rescue of the victim and her four children! Date/Time: March 10, 2019 / 03:30 P.M.